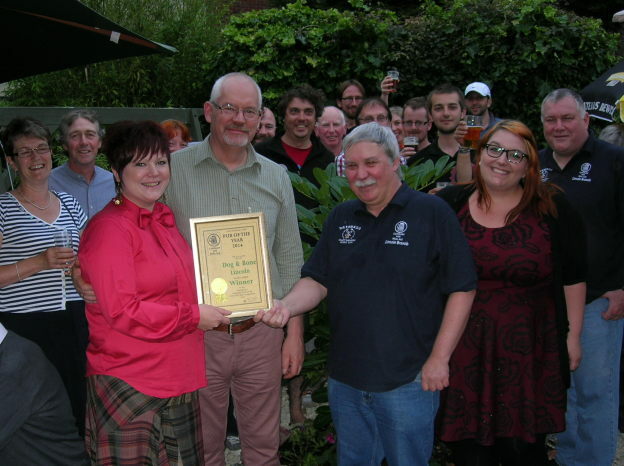 Lincoln CAMRA’s top pub, the Dog and Bone on John Street, has gone one better, with the award of Lincolnshire Pub of the Year for 2014. Judges from the Campaign for Real Ale visited the winning pubs from each of the CAMRA branches in the county and assessed the quality of the beer, the atmosphere, service, community focus and value for money. Half Moon, Willingham by Stow. One of the changes Chris and Sarah made since taking over the pub in February 2013 was to convert an outside storage shed into a cosy drinking area. The Kennel, as it is called, can be used for private functions or by community groups. Activities based at the pub include a walking group, jam sessions, art exhibitions and cook-offs. And, recently, a craft and chat group has started. Members meet on a monthly basis to discuss ideas and share techniques. So far, they have covered sewing machines, brooch making and felt making; the next session will involve tie-dying. The Dog and Bone now goes forward to the East Midlands round of the competition, where it will be up against the best pubs from Derbyshire, Nottinghamshire, Leicestershire and Rutland. Previous Previous post: Pint of the usual?